Showing results for "white nursery furniture"
Add simplistic style to your little one's nursery or bedroom with this Child Craft Abbott double dresser, featuring framed panels and hooded metal drawer pulls.Gift Givers: This item ships in its original packaging. If intended as a gift, the packaging may reveal the contents. Non-toxic finish Easy-glide drawer runners with safety stops Patented T-lock assembly system Coordinates with Child Craft Abbott nursery furniture What's Included Double dresser Instructions Assembly hardware 32.75H x 52.25W x 19D Maximum weight capacity: 100 lbs. MDF, laminate Spot clean Assembly required Manufacturer's 5-year limited warranty For warranty information please click here Imported Model Numbers Walnut: F01909.47 White: F01909.46 Size: One Size. Color: Brown. Gender: Unisex. eBay Convertible Baby Bed 5-in-1 Full Size Crib White Nursery Bedroom Furniture New! eBay Convertible Baby Crib Full Size Bed Nursery Furniture Toddler Infant White New! 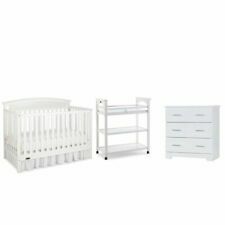 eBay Baby Dresser Changing Table Drawer Nursery Furniture White Wood Changer New! eBay Baby Bassinet Metal Frame Wheels Nursery Furniture Ruffled Canopy White New!